Knocked Another Item Off My List! | The House of Martins The House of Martins: Knocked Another Item Off My List! Knocked Another Item Off My List! I've been an AWFUL blogger lately - so first let me say sorry for that. 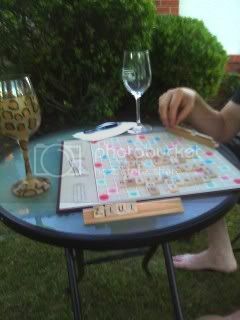 But for a quick update on my 30before30 list (now 30while30) I beat Jonny at Scrabble! I guess if you play enough its bound to happen and it may never happen again - but at least I can say that I've done it. So that's #15 done. I also attended my first Toastmasters Meeting - which I am going to count for #24 my public speaking class. Maybe the zip line at moaning cavern next? P.S. sorry for the blurry photo - but its a cellphone photo. Don't you love my leopard print wine glass? haha! Yah we are a little bit game obsessed. Scrabble, Trivial Pursuit, Cribbage, Chinese Checkers... we play it all. Jonny hasn't quiet taught me chess yet.